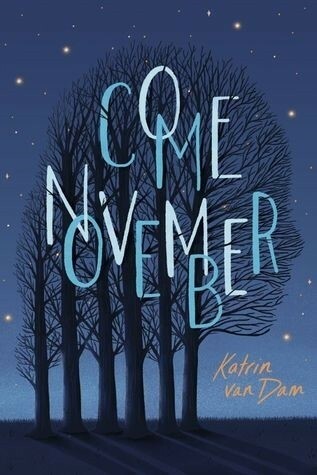 Author Chat with Katrin van Dam (Come November), Plus Giveaway! Read on for more about Katrin and her book plus an giveaway! Growing up, Katrin van Dam lived for singing, dancing, acting and generally showing off. She majored in Theater Studies at Yale and then moved to New York to become a Big Star. She soon discovered that she had a crippling attachment to food and shelter, and that her acting “career” was unlikely to yield much of either, so she got a job in children’s media. Twenty-mumble years later, she is a creative executive at a major media company and writes in her spare time. She and her husband, who met as acting interns at the New Jersey Shakespeare Festival, live in New York City. They enjoy seeing unreasonable amounts of theater, hosting raucous dinner parties and traveling. It's not the end of the world, but for Rooney Harris it's starting to feel that way. It's the beginning of senior year, and her mom just lost her job. Even worse, she isn't planning to get another one. Instead, she's spending every waking moment with a group called the Next World Society, whose members are convinced they'll be leaving Earth behind on November 17. It sounds crazy to Rooney, but to her mother and younger brother it sounds like salvation. As her mom's obsession threatens to tear their lives apart, Rooney is scrambling to hold it all together. But will saving her family mean sacrificing her dreams -- or theirs? Tell us a little bit about COME NOVEMBER and introduce us to Rooney. As the book begins, Rooney Harris is entering her senior year of high school. She’s been forced into a quasi-parental role because her mother is so wrapped up in the Next World Society, a group that believes that on November 17, they are going to be transported to a new planet to re-start human civilization. Rooney’s very frustrated with her mom, and feels responsible for her younger brother, Daniel. She really just wants to get through senior year and go off to college like everyone else, but her mother’s beliefs derail her plans. Rooney definitely isn’t me, but we do have some things in common. We both believe that we need to be in control of every situation and we tend to be a little too convinced of our own rightness. We both default to anger when we’re out of our depth. And Rooney may also sound a little bit like me. Beyond that, she’s totally her own person. What sparked the idea to write COME NOVEMBER? Did the plot come first, or your characters? How did you approach creating Everett? As the leader of the Next World Society, Everett had to be someone who could come across as either impressive or a con artist – he needed to have a little ambiguity. For believers, Everett’s way of speaking might make him seem intelligent and credible, but a skeptic could easily read him as someone who’s hiding something behind a lot of flowery language and a fancy accent. I also needed Everett to serve as the mouthpiece for a catalog of facts about climate change that are real and important. So I made him someone whose primary form of address is the monologue: he enjoys the sound of his own voice and is used to commanding the attention in a room. What about creating the Next World Society? I just tried to imagine all the different kinds of people who might be drawn in by someone like Everett and by his message. In the first draft of the book I included a few additional storylines that tracked some of the other members of the NWS – people who were really tearing their families apart in order to follow Everett. Ultimately those characters got cut, but I’m still really moved by the idea of people having to make that terrible choice. Have you always been interested in environmental/climate change issues? How did you research these areas? Yeah, I’m a little obsessed. One of my friends likes to call me “Cassandra” because I can’t shut up about it (I used that for the character of Anjelica in the book). There are a few writers who have shaped my understanding of what we’re facing. Elizabeth Kolbert is one; she’s such a strong, vivid writer and makes things so clear and easy to understand. There’s also a book by Mark Lynas about how the planet is going to respond as the atmosphere warms that I was very influenced by. I also read a lot about flood plains in New York City. My original outline for the book actually included a massive hurricane hitting New York and causing catastrophic flooding. But by the time I had a few chapters written I realized there was just WAY too much incident in the book and some stuff had to fall by the wayside, so I eliminated the whole hurricane storyline. And then the following year Superstorm Sandy decimated huge swaths of New York and I thought, “it’s a good thing I cut that part, since everyone would assume I added it in response to what happened.” But yeah, Cassandra saw that one coming. COME NOVEMBER is chock full of fleshed out supporting characters, including Rooney’s mother, Anneliese. Can you tell us how you developed this character? Anneliese is the one character who was loosely based on a real person. Not her involvement with the NWS or anything like that, just the way she talks and looks. That childlike quality. This woman was related to a friend of mine, and I remember talking to her once, and her saying, “it was just super… DUPER!” in this breathy, excited little-girl voice, and I thought that was hysterical, and so alien to me that it really intrigued me. Mrs. Fisher was inspired by a newsletter from the wonderful Quaker boarding school my husband attended. I love reading their communications because they’re always so thoughtful about caring for people and for the world. Back when I first started working on the book, they sent out this letter about a Ghanaian scholarship student who was just crushing it at the school. He sounded like an all-around spectacular person: A great student, athlete and human being. And I thought that was such an interesting background for a person, so I borrowed it for Mrs. Fisher. For the aspiring writers who may read this, please share a bit about your path to publication. And then that offer fell through and no one else wanted it. It was just a flood of rejections. So based on the feedback we were getting I spent about six months doing a massive rewrite on the book. I cut around 150 pages and reworked huge sections of it, and still no one wanted it. And the flood of rejections turned into a trickle. And two years passed, and I basically gave up hope and moved on to trying to focus on the next book, when we suddenly got the offer from Scholastic. Let me just say, it’s a good thing I have a day job and a fulfilling home life, because I would have lost my mind if all my emotional energy had been focused on publishing this book. How has your background in theater and children’s entertainment informed your fiction writing? Having trained as an actor, I’m always very focused on the way characters sound. I have to be able to hear them in my head and on my tongue, and I’m very critical of anything that sounds inauthentic or not like the way humans talk and behave. I’m much more confident about dialogue than I am about plot. I don’t really have favorite writers, but I have favorite books. In the YA space, I love Eleanor & Park and I’ll Give you the Sun and Two Boys Kissing. Some of my favorite novels for adults are Corelli’s Mandolin and The Time Traveler’s Wife. If a book can make me laugh and cry without ever feeling manipulated, it will have my heart forever. Bonus points if it also makes me think about something I never would have come to on my own. When you are not writing, what are your favorite hobbies & activities? I love to cook, love to have close friends over for a meal. My husband and I go to the theater a lot, since we both come out of that acting background. We do a fair bit of traveling – we recently went to Australia to scuba dive on the Great Barrier Reef, which was a bucket list item for me. I used to love dancing, but my body is all busted now, so I take a lot of walks in the park to satisfy my need for movement. What are you writing now, and when can will we see it? I’ve been working on and off on a book about Rooney’s younger brother, Daniel. As I was finishing COME NOVEMBER he was the character I was most interested in spending more time with. I think Rooney’s arc leaves her in a good place at the end of the book, but Daniel is more up in the air. I wanted to know what happened to him. And as for when you can see it… that’s only partly up to me. As I learned from the process of selling this first book, you can never make any assumptions. But I hope that COME NOVEMBER does well enough that people want to hear more from these characters. I just launched my website at katrinvandam.com [katrinvandam.com] and I really hope people check it out. The look of it is very inspired by the beautiful cover art that Maeve Norton created for the book, so every time I look at it I get all happy. I’m also on Instagram at @katvandambooks. The cover is attractive and the synopsis is interesting. Good luck with the novel. I've been reading some memoirs about scientology. Come November reminds me of that -- stories like this are so interesting. The cover doesn't necessarily make me want to read it, though. I love the cover, it’s so pretty and fallish. The summary has me so excited to read it! The cover is really beautiful and kind of lonely. The synopsis sounds really interesting. I've already heard so many great things about this book. It sounds like it will be serious page turner, full of tons of great content! I'm super excited to check this out. Plus the cover is so beautiful, I love the color and details. I love the cover. The synopsis sounds unique and intriguing. The cover is very unique and the story sounds very interesting!